Porsche's U.S. sales chief expects sales of the freshened Cayenne to approach 18,500 this year. SAN DIEGO -- Porsche Cayenne sales will rebound in 2015 as several variants of the freshened crossover go on sale, the brand's U.S. sales chief said. "I clearly expect to come back to the level of 18,500 Cayennes," Porsche Cars North America CEO Detlev von Platen said at a press event here. "It's been extremely successful in the United States." Cayenne sales dipped 12 percent in 2014 to 16,205 vehicles, from a peak of 18,507 in 2013. Von Platen attributed the decline to fewer available vehicles because of the production changeover to the freshened version. 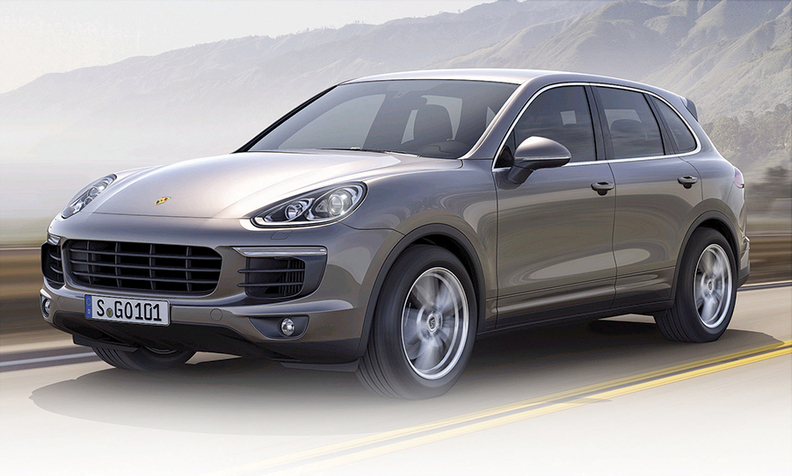 For the 2015 model year, Porsche revamped the Cayenne's front- and rear-end styling. The freshened Cayenne also received more power, improved handling and better fuel efficiency. A 420-hp 3.6-liter twin-turbo V-6 engine replaces the 4.8-liter naturally aspirated V-8 in the Cayenne S. Other engines in the vehicle line have been improved. A plug-in hybrid is available for the first time. A diesel model, the Cayenne S and the Cayenne Turbo with a 520-hp 4.8-liter twin-turbo V-8 went on sale in October in the U.S. The Cayenne S E-Hybrid went on sale in January. The base Cayenne and the Cayenne GTS went on sale in late February. The Cayenne Turbo S will be available for sale beginning this summer. The GTS and the Turbo S are 2016 models. The rest are 2015 models. Prices start at $59,295, including shipping. Von Platen said the changes were aimed at maintaining the vehicle's position as the sports car of its large-crossover segment. "You will not drive a truck," he said. "You will drive a Porsche." Von Platen has high hopes for the Cayenne S E-Hybrid. He expects the plug-in hybrid to contribute 10 to 12 percent of Cayenne's U.S. sales. U.S. dealers have about a 15-day supply of Cayennes, but inventory levels will build through the spring as the new models come out, von Platen said. He expects to be at a 45- to 50-day supply by midyear. It's too early to tell whether the Cayenne will maintain its lengthy run as Porsche's best-selling nameplate. Porsche also has high expectations for the new Macan midsize crossover, which went on sale in 2014. While demand is high for the Macan, availability is severely limited. Porsche had just 150 Macans available in late February, von Platen said, spread across the brand's 189 U.S. dealerships. When more supply is available, Macan sales could approach those of the Cayenne. Said von Platen: "My gut estimate is I expect one-to-one Macan-to-Cayenne in terms of demand."